NOTE: pierogi is the plural. Pierog is the singular. It’s not necessary to add the es/s to make the plural. My Polish mother often talked about these, Sadly, she wasn't much of a cook, so she never made them, My daughter and I have plans to try them! It's Pierogi (plural) not Pierogies. I have a dear friend who is polish and gets so upset whenever she sees the "es" on the end. However, your recipe is spot on delicious. I can't swear to it, because I just realized I don't have the serving size listed here, but I "think" this recipe makes about 3 dozen. So doubling it should give you 6 dozen and you'll need 8 medium size potatoes. Enjoy! 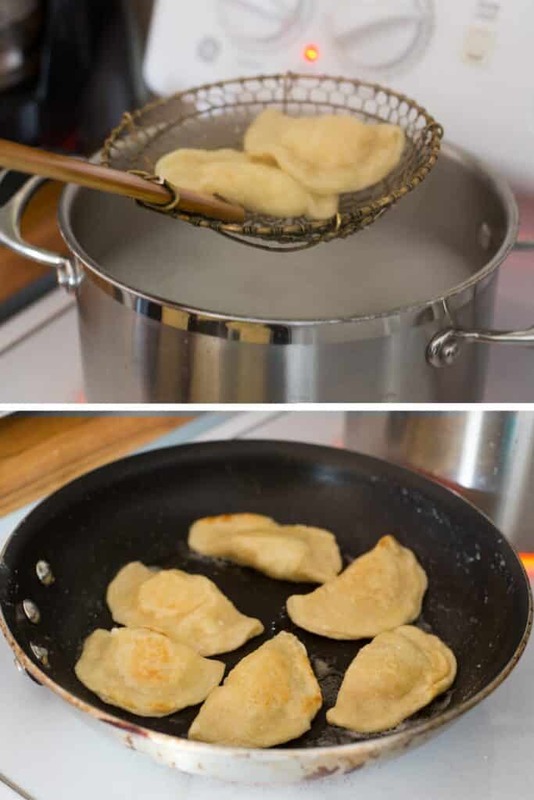 my family is Ukranian and we always had varenyki (pierogi) the traditional way, boiled then fried back then in salt pork, now we use butter. My aunt used to make deep fried pierogi. The dough she used was a yeast dough that had to rise. It took half the day to make these but they are a real treat. Taste more like a doughnut with a filling of your choice, potatoes, cheese, cabbage, etc. They are deep fried in vegetable oil. My Polish grandmother made our pierogies with Cottage Cheese and cooked them in heavy cream after frying them in butter. She let most of the cream absorb into the pierogies and used the rest as gravy. She always served them with pork chops. I was taught to make them with cottage cheese also. Originally using 'dry' cottage cheese. Seasoned with salt, pepper, and onion. I didnt like regular onions so I have always used onion powder. My family learned how to make them 36 years ago. Soon after the first ones, we started adding some fried ground meat into the mixture. Absolutely LOVE them.. I think I might try doing the cooking in heavy cream. I would love to make these some time. Are you able to freeze them? 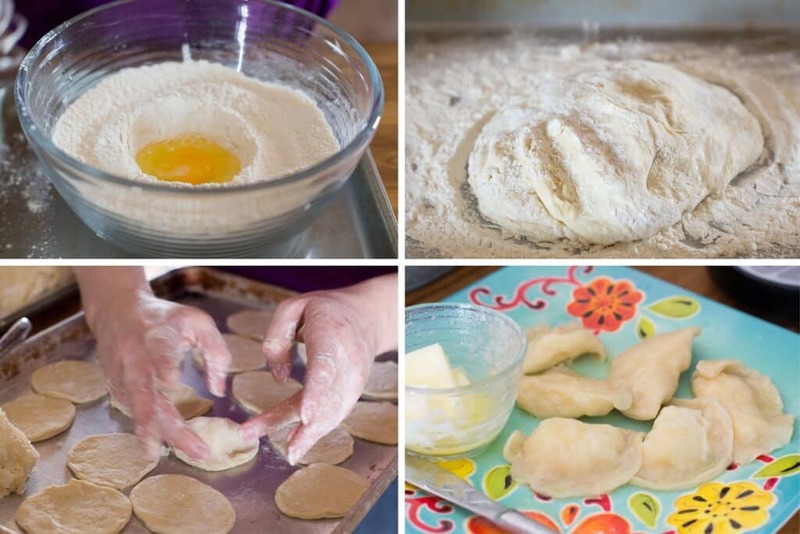 Yes, you can freeze pierogies before or after cooking. I am trying to make these but the hot water seems to have scrambled my egg. My dough seems very chunky. Any suggestions? 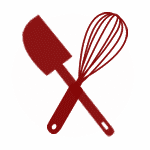 It sounds like you might have added the hot water before stirring the egg into the mixture completely. I've never run into that. If there were still loose bits of egg, you quite possibly did scramble it with the hot water.To be honest, I'd probably start again. 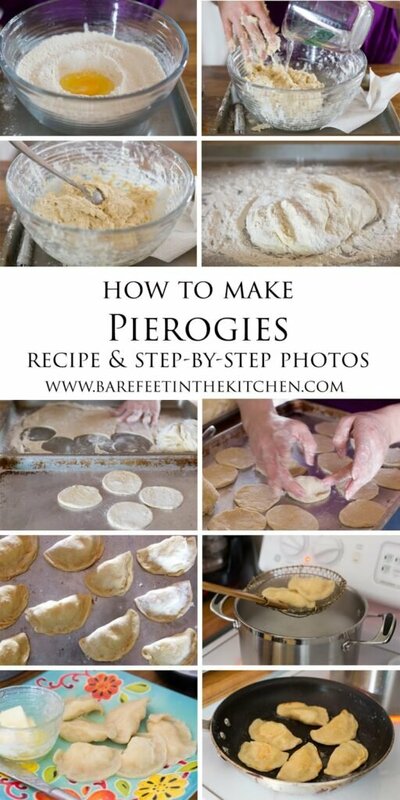 I'd hate to go to the effort of making pierogies and then have them turn out strangely. 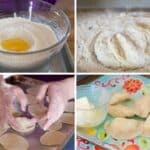 I had always wanted to try making pierogies but have been a little hesitant. Thank you for providing a simple (but delicious) recipe! I've made it twice and my family loves it! My mother made hand sized pierogi and when I asked my uncle he said my grandmother also made them hand sized. I guess when you have five kids the ravioli size won't do. My favorite was potatoes and saurkraut. I make these the very same way only not with the sauerkraut! My grandmother was polish and showed my mother how to make them. They are delicious! I have a problem when I make mine as soon as I cut them the dough it shrinks. Is this because the dough was over worked? Over-kneading the dough will develop too much gluten. And often, if a dough has too much gluten it will shrink when cut or heated. So, I'm thinking that your guess is probably correct. Where can you find the farmers or dried cottage cheese. I buy it at the farmer's market here in Phoenix, but sometimes the smaller markets carry it. I've found it at Trader Joe's as well. Every two years we have a Lithuanian reunion with many of our favorite dishes. Our pierogi are more of a peasant dish handed down from our grandmother. The dough is simply flour and milk and the filling is just cottage, or farmers cheese if you can find it, egg, and salt. We boil them and serve them with your choice of butter or sour cream. Leftovers, if any, are fried the next morning for breakfast, in bacon fat until browned and crispy!